Henry Talbot returns and brings the old Downton with him. Tonight was the first night that Downton looked like anything other than a funeral home in far too long. The world is changing but that doesn’t mean we can’t have juicy upstairs drama along the way. I think holding off on a return was a smart move. As Tony Gillingham and Charles Blake have shown us, a Mary romance is strongest when it favors brevity as opposed to the Mary/Tony/Charles failed love triangle over the past two series. Both of them were good characters, but they overstayed their welcome. 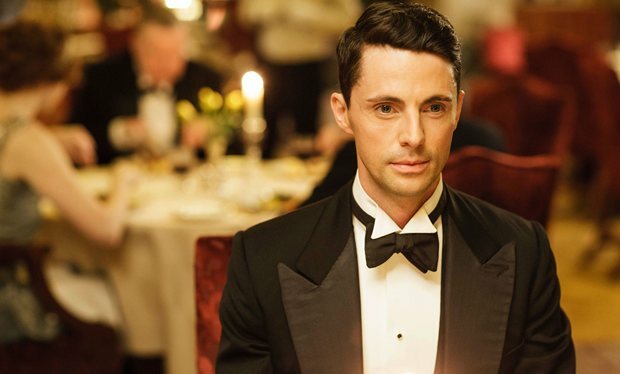 I’m a huge Matthew Goode fan and I was very impressed with how well he meshed with the rest of the characters. The party was a big hit. Many ofDownton’s best scenes have come from the dining room, but this series’ dinners have been fairly depressing. Having a full boisterous table was one of many callbacks to the early days. As was Gwen! Her reintroduction was handled quite well. I was skeptical considering how long it’s been when you consider how many people in the house never really knew her, which was also exacerbated by Carson and Hughes’ absence. I loved how Sybil was effectively woven into the narrative. It’s been a while since the characters actually reflected on her as a person rather than just bringing up how much they miss her and it was great to see her legacy factor into the Mr. Mason decision. I was very conflicted about The Dowager’s behavior until the end of the episode. She delivered a few zingers throughout the episode, but her quest for power was very childish. I don’t love that Fellowes waited four episodes to divulge this fairly important detail. We’ve rarely seen the Dowager act without good intention and it was shocking to be lead to think that could be the case for this long. Poor Barrow. His “outing” of Gwen was juvenile and quite frankly a little beneath him at this point. We don’t need nasty Barrow back, especially after his heart to heart with Baxter. It was very interesting to see him as butler. Over the past three series, we haven’t seen much of what he actually does as underbutler other that serve things and open doors. The Barrow/Molesley dynamic has always been a bit awkward, but it worked here. I was sad to see Barrow tell Molesley he should save his pity for himself. How rude. I see two possible outcomes for Barrow. I think he could kill himself once he’s finally forced out, but I do think that his lordship will die and Carson and Hughes will leave to start their Bed & Breakfast. The only thing that really complicates this is the Mary/Henry storyline, but I’m also not very convinced that they’ll actually end up together. A flirtatious subplot seems just as likely. Molesley had a role in multiple storylines for a change. We don’t really know what his storyline is. There’s been hints of wanting to be a teacher and he is wooing Baxter, but he doesn’t have anything of substance of his own. It kind of undercuts Barrow’s search for a job since Molesley would presumably also want to find a more permanent position than as the oldest footman in England. Andy showed some life for once. I imagine he might leave to help Mr. Mason and Daisy run the farm. I’m glad we got a little more screen time with him as it makes it easier to care that he exists. Daisy’s outburst was a little over the top, but it kind of worked. If we assume that she’ll leave to help Mr. Mason, this does set up her exit. Seeing the whole downstairs staff try to talk her out of it felt too soapy, even for a show likeDownton. Edith didn’t get as much screen time, but her character continues to shine. I like that they’re balancing her career and personal life better than previous series. It was smart not to have her fret over the Drewe’s departure since let’s face it, Edith spends way too much time depressed. As does Anna. Was the miscarriage drama really necessary? Can the Bates go a single episode without having cause to cry? Please Fellowes, either kill them or let them be happy. This suffering needs to end. This is a bit of side note, but I found it odd that Rosamund has a footman. Shouldn’t Mead (who hasn’t been seen on camera since series one) be able to run Belgrave on his own? IT just seemed awkward when Mary was there and earlier this series when Edith was visitng. I initially rolled my eyes when Rosamund was featured in yet another episode, but she was okay this time. She is a supporting character best appreciated in small doses. Unlike Spratt, who should be every episode. Why was he missing? Unacceptable. Cora continues to be fairly unlikable, though she earned points for supporting the farm. I didn’t like how she assumed Molesley was gossiping about Baxter, but she also admitted that she didn’t say a word to Gwen for the two years she lived there. I wish we could’ve seen Daisy ream her out. I’m sure she deserves it for one thing or another. The Baxter storyline isn’t that interesting. Neither is she. I don’t think the show necessarily needs filler so I’m not a huge fan of the storyline. Not a fan of the Carson/Hughes reception. Would calling her Mrs. Carson have truly been the end of the world? Sure it was slightly amusing, but they took it too far. That’s it for this week. Another strong episode. We’re halfway through the regular series. So far, I’ve been impressed with the way the show’s balanced entertainment and wrapping things up.